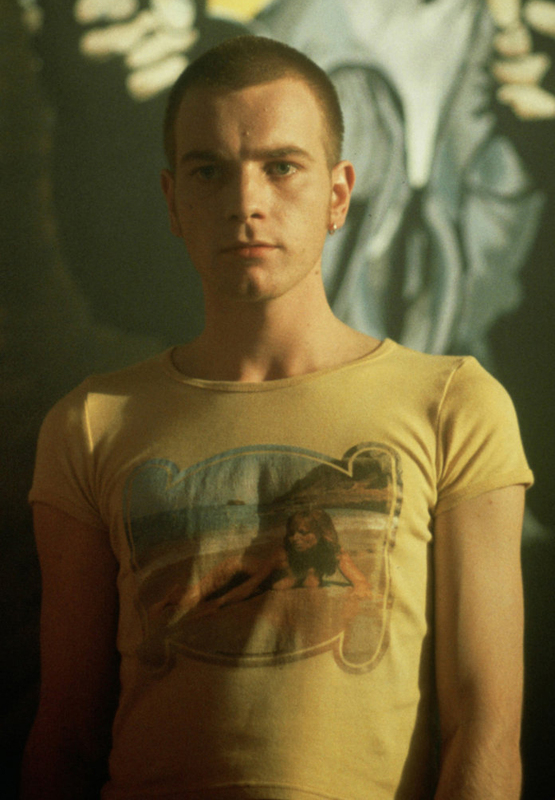 So, it’s Ewan McGregor today. A great change of emotions for the two “eternals”, a real battle for the top spots of the standings, where after CSKA (who have a serious advantage) everything is up for grabs. Teams are reborn through their defensive mechanisms and their survival instincts in a competition that needs high mental stamina. Olympiacos were nearly perfect in terms of performance and walked all over Fener. A very convincing, impressive outing, which was very much needed for coach Sfairopoulos’ team amidst a very difficult period, during which the team was on the ropes, after taking several blows. The way the Reds approached the game, as well as the way they executed was close to perfect, and they hope that this night will help them put the recent crisis behind them and come back stronger and fight for one of the top spots in the regular season. Rule: Α Μοving Defender is Hard to Screen.. The great numbers Olympiacos had from behind the arc (13/17 three pointers, incredible) played a major role in the final outcome of the game, and changed the approach of the game, but the element that was the foundation for what we saw on Friday night was the way the home team’s defense fully deactivated the most efficient half-court offense of the league. The Reds approach in this part of the game is very interesting. Smart, realistic, designed around the defensive characteristics of the team. Olympiacos’ staff knew that they didn’t have the guards to pressure coach Obradovic guards high and transfer the pressure on the ball, so they focused on Fener’s off the ball game. The gist of the Reds “advantage” (early in the game) is the way the Greek defense controlled the screeners (and in general the screening actions) and the cutters of Fener in half court offense, thus deactivating the communication and creation of the Turkish team’s guards. Olympiacos didn’t allow for switches in their man to man, thus reducing the number of miss matches in favour of Fener (this is the pillar of a “Read and React” offense that knows how to read, decode and exploit the half court “advantage” in many ways). The Reds only “gave” switches when McLean was on the floor, but in this case these switches were very controlled. The Greek team’s behaviour in off the ball screens is exemplary, and it is the main factor for disrupting communications between the strong and the weak side in the European champions’ offense. In respect to how Olympiacos’ players defend these off the ball screens, the instructions were, in most cases, Go Ballside (i.e. Slip Inside, the defender following his opponent in the action from the side where the ball is) or Outside & Chase, always having in mind to not allow for miss matches through the “switch” approach on defense. This is how (also showing great motor) Olympiacos controlled Wannamaker’s Cuts (coach Obradovic relies on them very much both in Horns and plays out of the 5-Out tank), they deactivated Flares, diagonal & shuffle screens, which are used a lot by the Turkish team for Datome, and using ICE on side picks (1-4 Low with Sloukas) basically destroyed the communication on their opponents’ offense, thus highlighting for the first time this year a problem in the entry pass when coach Obradovic was forced to move the centre of creation and give to his forwards. The feeling I got when watching the game, in conjunction with the context created by the tactical approaches of the two coaches, is that Fener’s guards (with the exception of Dixon) showed a lack of personality in this game. Wannamaker and Sloukas (the main ballhandlers of the Turkish team) were not good, they didn’t try to break through the Greek defense, and didn’t attack on Spanoulis or Roberts. Sloukas is one of the best guards of the league, and he has a winning culture, but he stayed on the bench, as it was clear that he wasn’t “there”. Well, it’s not the first time something like that happens… They appeared to be scared and refused to execute early, despite the defensive approach of the home team (i.e. not switching on defense) giving them this chance. 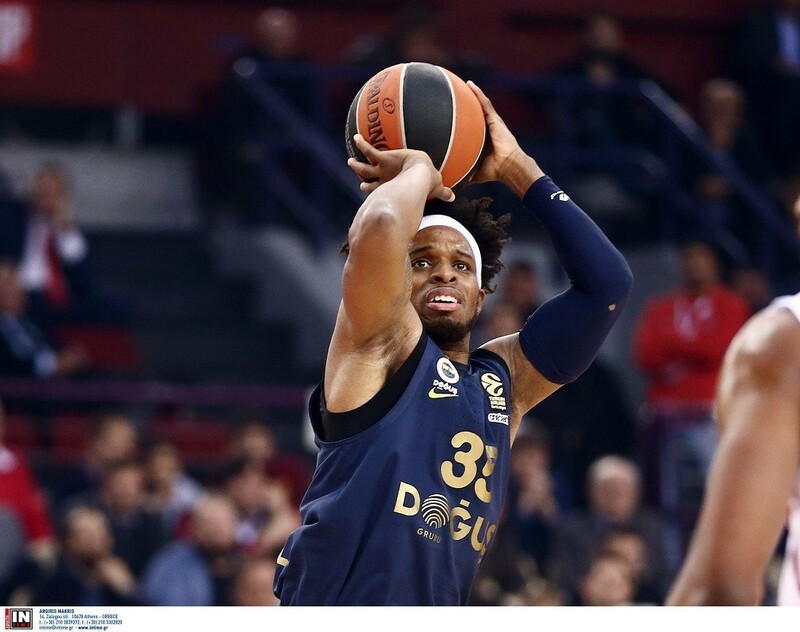 The only guard that managed to do it was Dixon, and for the duration the American guard “connected” with the basket, Fener seemed to return to the game; this ended when coach Sfairopoulos put Papanikolaou (who was once more very good) on him. Acturally, the Tuskish team’s guards learned their lesson from Vassilis Spanoulis, who dominated the game from the beginning. In the game’s preview for Stoiximan, I used a video from the same matchup three years ago, highlighting the pressure the Reds captain put on the Turskish defense. Some things never change, despite the years passing by. 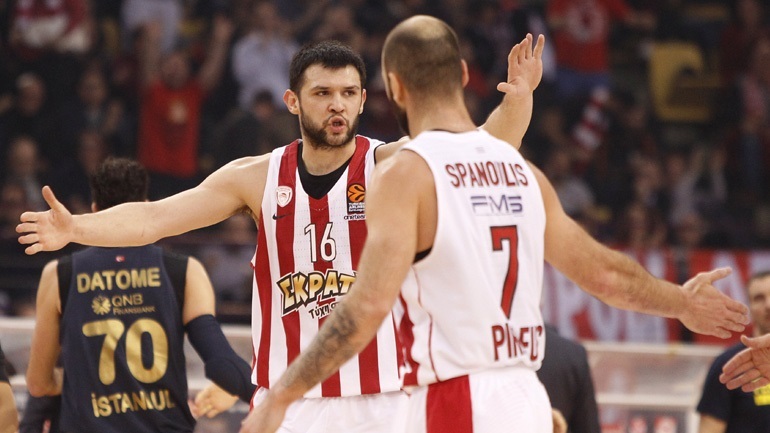 Olympiacos relied from the beginning (Horns with Hand Off to make their player move around the court and “check” the reaction of the defense) on Spanoulis, who was very aggressive and decoded coach Obradovic’s choice to play a defense that was bordering Pack Line. 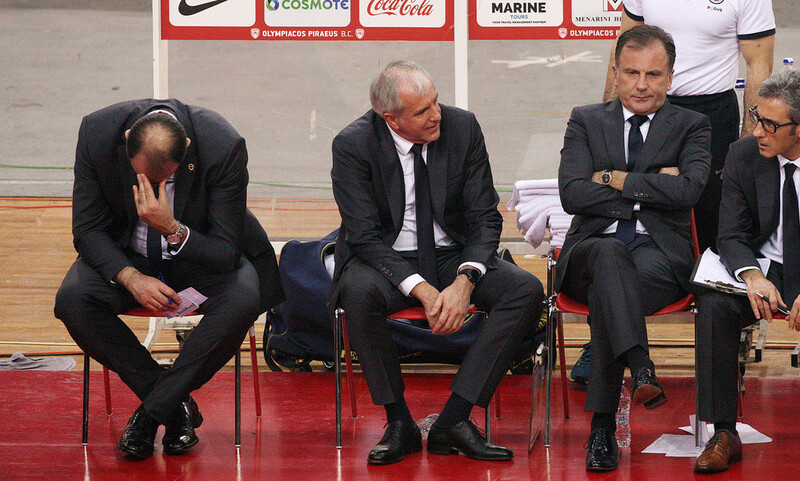 Coach Obradovic (he also had a bad night) opted to go “BIG” for the entirety of the game, refusing to play smaller with Kalinic (he has to get back his “plasticity” on offense, you think he is going to … break when you see him dribble/pass/execute the ball) and opted for a Step Back(Thompson)-Fight Through(Wannamaker) approach in the Down Screens Olympiacos run for Spanoulis, when they wanted him to get from the baseline to the top of the key. The way Spanoulis reads the moments of defensive imbalance is exemplary, as is the timing he passes and lobs the ball on the back of the Turkish defense. In turn the Turks used several poor “switches” and completely failed (as opposed to Crvena Zvedza, for example) to control Olympiacos’ baseline cuts. 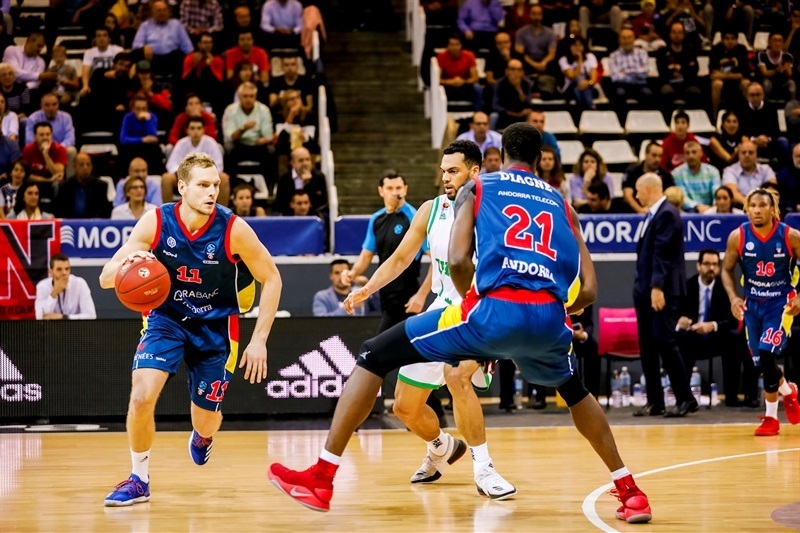 We should also point out the great performance of Jannis Strelnieks (19 points, 4/4 three pointers, 4 rebounds, 3 assists in just 18:35). The Reds used the weak side of their offense more in this game, and exploited the fact that coach Obradovic chose from the beginning to “oveload” the main lane of his defense (Vessely floated constantly, and Printezis made him pay). Their incredible outside shooting worked as a kind of invisible power that showed them to use the weak side more. Even Single Drag Screens in transition offense ultimately aimed at getting the ball there. Strelnieks is a player that can produce from the weak side. It is unthinkable that this guard is not constantly a “factor” in Olympiacos’ offense, which is still the weakest in the Euroelague. In the 4-shooter lineup (Roberts-Strelnieks-Thompson-Wiltjer plus McLean), one of the very few that were negative in the plus-minus ratio, the Reds go from Horns to their 1 in – 4 out tank, without having the required slashing to take advantage of the increase in spacing or playmaking in a guard that will make their opponents’ defense pull back towards the rim. These are very important details that can create a far more fitting context for a scorer such as the Latvian, whose quality is undeniable. I implied on Saturday night that the Reds are looking at Jaka Blazic. 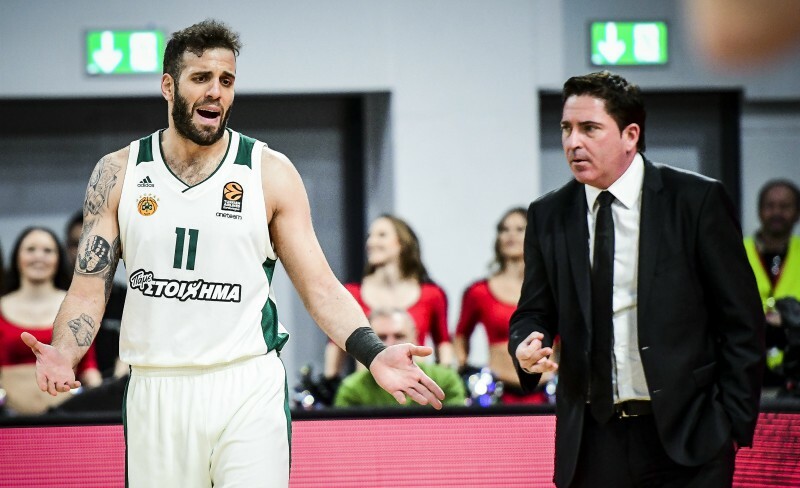 Today his name was heard… Giannis Sfairopoulos (he said that he didn’t know anything after the Greek League game against Kymi) said what a coach has to say in order to keep his team balanced. The Slovenian player can bring on the ball defense and slashing, which the team does not have at the moment, but – pay extra attentions here- Baskonia’s off the ball multi-cutting offense is one thing and this year’s Olympiacos’ offense is another thing altogether. 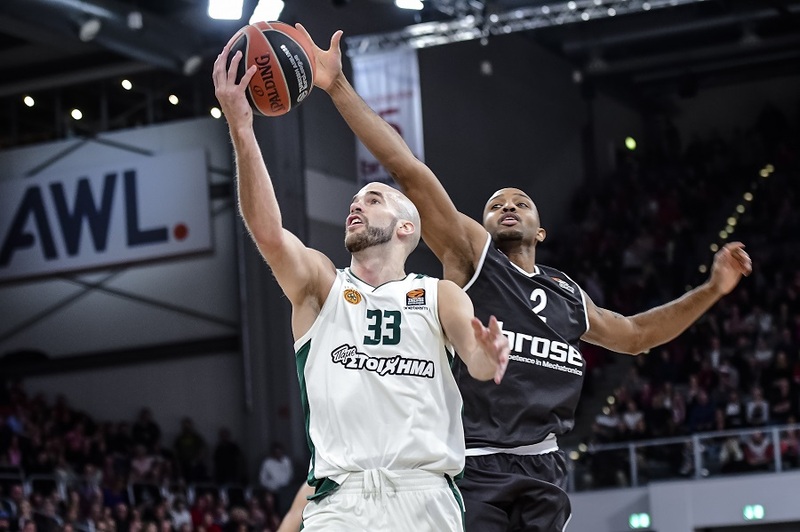 Nick Calathes’ impressive performance (31 points – 10/16 two pointers, 3/4 three pointers, 2/2 free throws – 7 assists, only 1 turnover in almost 36 minutes) wasn’t enough for Panathinaikos, who collapsed in the fourth quarter, conceding an incredible 38 points to Brose Damberg. 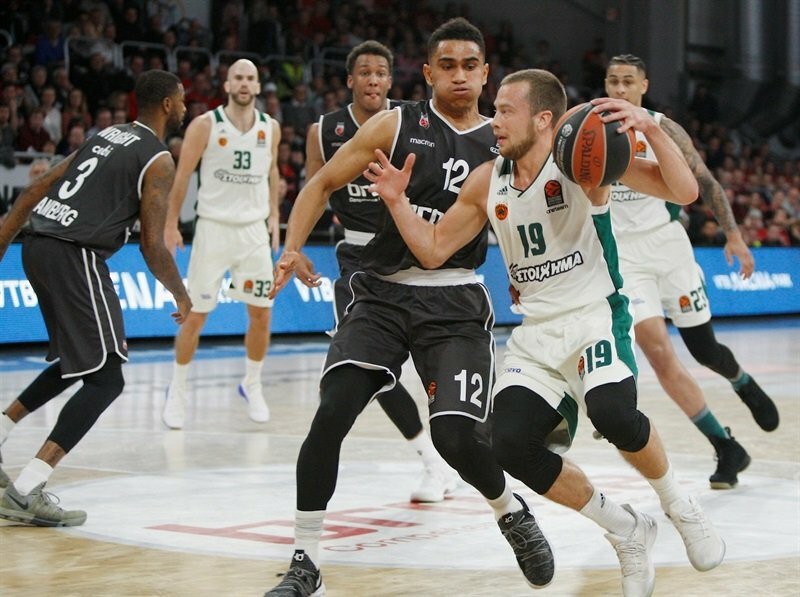 This nightmarish quarter is the best proof for everything we’ve talked about last year (and have almost become cliche) regarding the new format of the Euroleague, within which any kind of relaxing and not properly preparing is not allowed, and the possibility of losing (against any opponent, anywhere) a supposedly easy game is certainly there. What led to Panathinaikos losing so emphatically in Bavaria…? Panathinaikos were poor in every level and unfortunately the bad night many of their players had, occurred in the same night Xavi Pascual failed to go deep mentally and keep his team within the reach of the win. This happens to every coach. 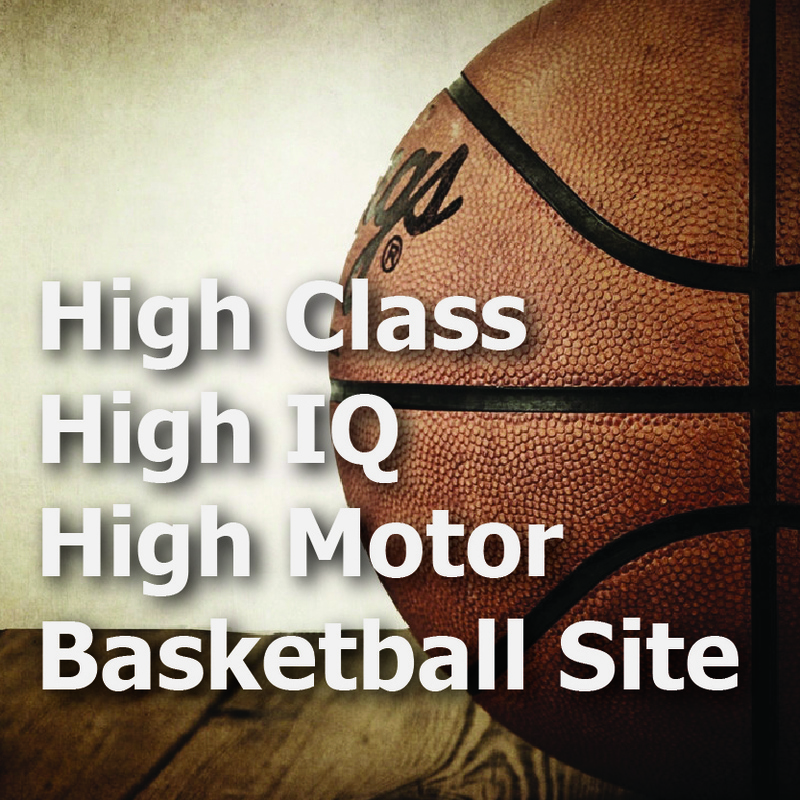 This is undeniable… I have seen really great coaches (even in NCAA divisions where there is a great difference in team quality between the favourites and the outsiders) going through what happened and being unable to “train” their mind and follow the flow of new offensive stimuli and data that a game of this level produces, which results in bad “reading”, reduced mental stamina, and loss. The mind is, after all, a muscle that is fed by training. Note: We have to highlight one more time how Panathinaikos’ offensive puzzle has been affected by the absence of Lojeski’s off ball offense. Its importance is more that the individual performance of the player, as it is the context within which the Greens can deploy several actions. It’s not a coincidence that Panathinaikos start their games with this. None of coach Pascual’s shooters works around screens and moves off the ball as Lojeski, which makes him an excellent fit for Calathes’ game (ok, the backcourt combination may look a bit… intellectual, but for coach Pascual’s offensive context, and with Pappas’ slashing following, it is a pretty good package). Also (remember what we were talking about last summer) it became obvious how important Singleton’s Strech-ability form the “4” position is for this year’s Panathinaikos team. -The Greek team’s performance in the fourth quarter was disparaging, but truth is that some things could be seen from the beginning of the match. Panathinaikos played maybe their worst Pick & Roll defense since Xavi Pascual joined the team, as they were unable to control the ball when it got out of Hard Hedge (bordering Trapping) and travel in these few moments when you are called to prepare the ground in order to balance the defense (it is the way you defend that leads to this inbalance, betting on quick feet, automatic rotations and the pressure it puts on the opponent to immediately read the situation) Panathinaikos’ defensive rotations looked very bad this time. Bamberg found it very easy to get the ball to Musli in the heart of the key. This was a very bad message. Panathinaikos’ feet were heavy (it’s not a coincidence that they found it very difficult to control the energy and the off the ball movement of a very good Olinde) and this is what hurt the communication lines on the defensive end. 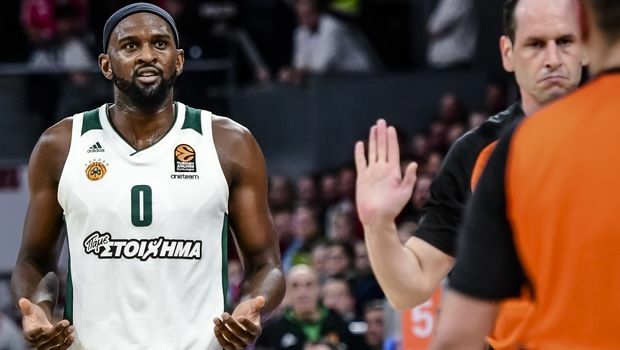 In my humble opinion, with Gist not being in shape (just see how he recovered after hedging) and Singleton trying to cope with the injury he’s been carrying in the past month (the coach talked about that today), maybe Panathinaikos should have tried a more conservative defensive approach (in terms of its aggressiveness). Maybe they should have played smaller. Seeing Brose “play” with the size of their lineups, I was expecting a “shock” with Thanassis Antetokounmpo at “4” (he was the main diver in Calathes’ PnR, a choice that was made in order to include Heckman instead of Rubit in the defensive action). Seeing his defense losing their positioning and personal battles, Xavi Pascual activated his own “Trojan Horse”. I am talking about the half court 1-2-2, about which we had talked about last year (after the match against Fener at OAKA). Singleton at the top and Gist-Antetokounmpo on the baseline with their ability to sprint to the corners, which, in this type of defense, are guarded by the baseline players. The choice of 1-2-2 was made aiming at the team improving their behaviour in close-outs (where there was an obvious problem in the first half), block their peripheral execution from the wing (and disrupt their ball movement), and increasing the chances of scoring in the open court (the formation with Singleton on the top and Calathes-Pappas on the wings behind them is a good fit for that), by making their opponents turn the ball over. This was a choice that worked well and covered up the team’s lack of stamina. Bamberg were unable to get the ball to the High Post and open up the defense (Radosevic’s absence played its role here). At that point I felt that coach Kantzouris’ best lineup would be Zisis-Hickman (attack the gap)-Wright (execution from the gap)-Rubit (High Post)-Musli(Low Post)… Panathinaikos came back to the game with Calathes showing us his offensive quality, but it seems that the Greens were out of breath and ideas to finish the job. Xavi Pascual’s rotation in the fourth quarter, which aimed at scoring, not safeguarding their rim, was the beginning of the end. Panathinaikos started with Lekavicius-Gabriel, looking for the shot that will give the proper spacing for PnR actions for Calathes-Gist, and then changed the latter with Denmon-Vougioukas. Bamberg were very smart to include Lekavicius’ defender as the screener in actions that took place in the Green defense’ middle lane, “locking” the switch with the Lithuanian (who doesn’t have the footwork or the length to control the ball in close outs, when he wasn’t on the back of the big man) with the impressive Augustine Rubit finishing the match. The package of the Texan former Ulm Center (strong upper body and hands, face up-post up game, ability to put the ball on the floor, off the ball screen that can clear the middle lane for guards, reliable footwork) is great. 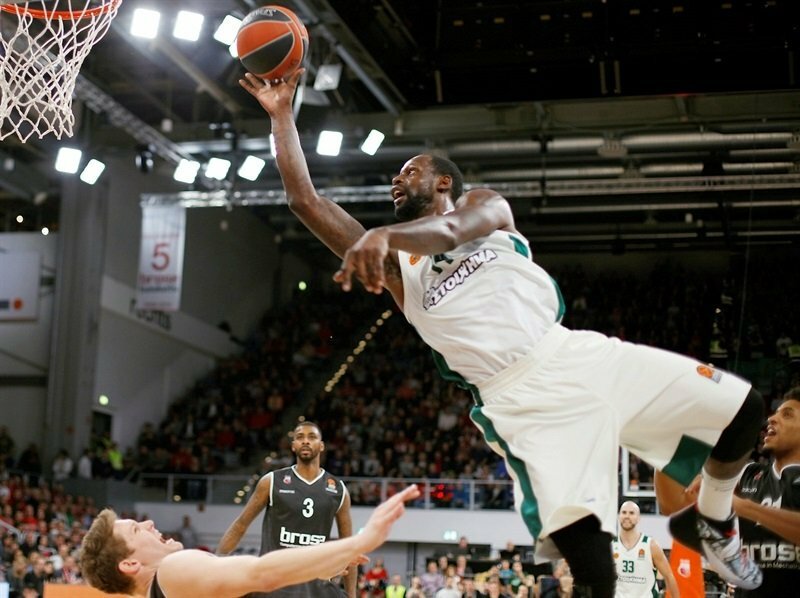 Despite the end of the Fleming era, Bamberg still have the know-how in identifying such big men. At the same time, Panathinaikos is on the market for a player of these characteristics. Xavi Pascual believes in Vougioukas’ diversity (big body, efficient post game) and given the fact that he wants him “alive” in the rotation, it seems that he will not go for a big man with size, but a better athletic package that can support the existing aggressive defenses. At the moment things are quiet. 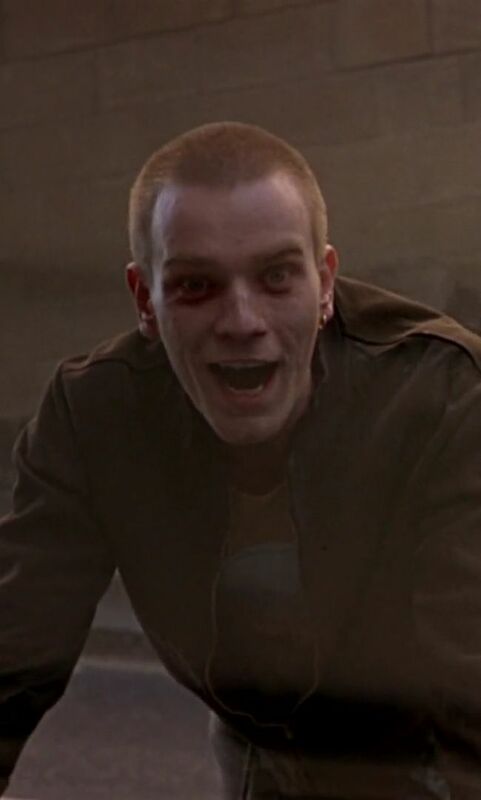 Maybe after Thursday we’ll have more news.